What Do You Need To Get A REAL ID License? If you are a New Hampshire resident and you wish to get a REAL ID compliant Driver License or Non-Driver Identification Card, you must apply to the Dept. of Motor Vehicles in New Hampshire, in person (whether renewing or applying for the first time) and provide proof of your identity and your NH residency. Please refer to the link below of required documents for a REAL ID compliant Driver License or Non-Driver Identification card. You will not be provided with a Real ID compliant Driver License or Non-Driver Identification card without those documents. For more information on document requirements please click here. Starting January 2, 2017 NH will offer REAL ID-compliant licenses to residents who choose to have one, when renewing their driver's license. Until January 2018, when traveling by air, residents in ANY state are still able to use a driver's license, or any other various forms of identification accepted by TSA. Starting October 1, 2020, every air traveler will need a REAL ID-compliant license, or other acceptable form of identification such as a Passport. 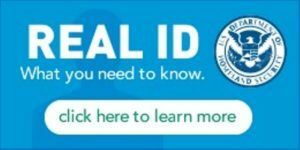 For more information on the National REAL ID Act click here.